As some of you may already know, normally at the end of the month I do a Wrapping It Up! post summarizing books I read for the month and sharing favorite bookish links. While there was much I liked about those wrap ups, there was MUCH more that I didn’t. They took me forever to write and didn’t really do that well. So, I’m letting them go this year and starting a new feature, Clearing the Shelves. I’ve done a few Clearing the Shelves posts over the last year. Those came up whenever I got really backed up with reviews. 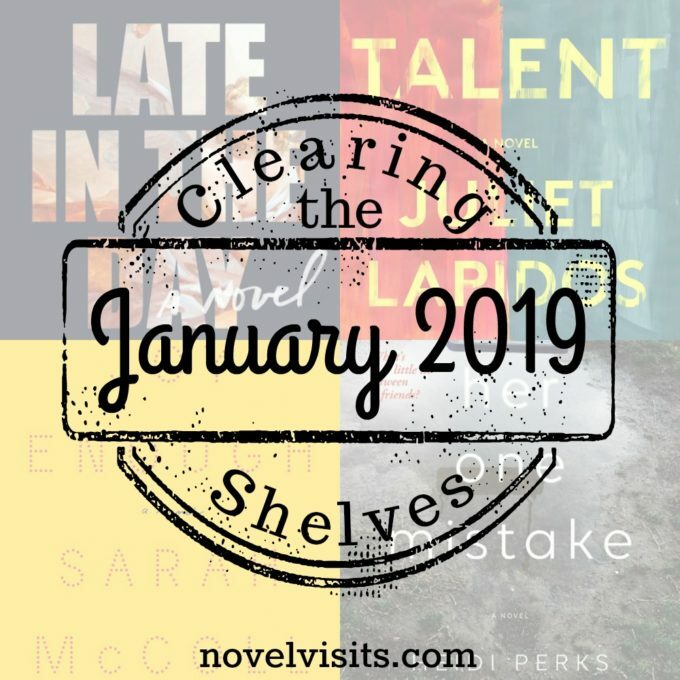 For 2019, I’m going to try and be more systematic, doing one Clearing the Shelves post at the end of each month. Some months that may only be a couple of reviews, but today It’s four! My Thoughts: Alex and Christine, Zach and Lydia have a complex relationship. They’re best friends, both as couples and singles. They also have a complex history. In her early 20’s Lydia pined after Alex, the dashing young writer, but her interest was never returned. Christine dated Zach for a couple of years, but they parted as friends. As two married couples they shared a close bond, everything in balance and standing strong. Then, Zach suddenly died and for the trio remaining all balance was lost. I loved the first half of the story as Hadley moved between the present where Alex, Christine and Lydia were just trying to find a new footing, and the past where she slowly revealed the complexities of their many relationships. The second half of the book became more tedious, moving slowly. I found myself caring less and less about these very rich characters she’d created in the first half, that is until the very end where she drew me in again. 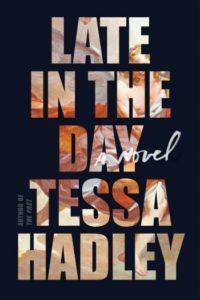 This was my first Tessa Hadley book, and I found myself drawn to her writing and her spot on renderings of characters in crises. Note: I received a copy of this book from Harper (via Edelweiss) in exchange for my honest review. Many thanks! My Thoughts: I love trying debut novels and I thought this book had a lot of promise. For the first couple of chapters, it seemed like I just might have been right, but then the book just went off the rails for me. This is a story about a young woman, Anna, who is struggling to complete her English dissertation. Really she’s struggling to even get started on it. 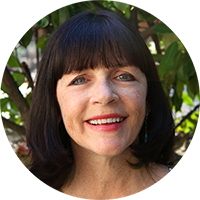 Her idea is to write on the subject of talent and whether it’s born or bred into a person. 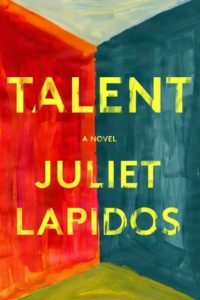 She stumbles upon a woman related to a local author who also had thoughts on talent before he took his own life many years before. While all this seems like enough elements for a story, none were strong enough to hold my interest. Note: I received a copy of this book from Little, Brown & Company (via NetGalley) in exchange for my honest review. Thank you! My Thoughts: This slim little memoir tried to pack a lot into a very small space and suffered for it. 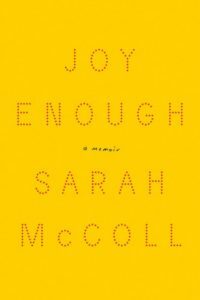 McColl seemed to have had much she wanted to share about her young life: the life and death of her mother, her own failing marriage, her journey toward graduate school, a new, better relationship. Any of these might have been a subject for a memoir, but in Joy Enough they ALL were. By far, the strongest of her”vignettes” were those of her mother. I only wish McColl had made that her entire book. Make no mistake about it, McColl’s actual writing is gorgeous, often times with an almost poetic quality to it. 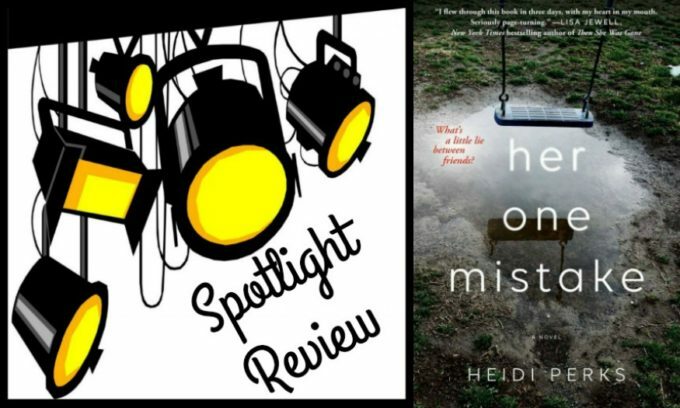 My Thoughts: I think in the genre of psychological thrillers Her One Mistake is probably fairly typical. Two women, Charlotte and Harriet, are best friends. Charlotte has brought her three kids along with Harriet’s daughter to a school carnival. She glances at her phone for a few minutes and when she looks up, Harriet’s 4-year old daughter is gone. Vanished. No amount of looking turns up any sort of clues. Harriet is devastated, furious, shattered by grief. Charlotte, wracked by her own guilt also suffers the blame of people who once were her friends. I’m glad Clearing the Shelves will be a regular feature. “[E]ven pretentious quality to it” – what I try to avoid! Yes, Talent was a big disappointment for me. I’d avoid it! OMG Joy Enough, I had SUCH high expectations from the press releases and when I got it on the day it came out I didn’t get 10 pages in before my eyes hurt from rolling – not from the material, I mean I lost my mother too and no one would wish to go through that and I have empathy but why is she trying so hard to be so smart. I can’t stand pretentiousness. Ugh. I am glad I was able to send it back for a refund. I like this feature! Late in the Day is intriguing, even with its unevenness. The description reminds me a little of both The Gunners and Tin Man. Late in the Day might be a bit like Tin Man, but I liked Tin Man much more. I wish someone else I trust would read it so we could compare notes. I had to laugh when I started reading this post: I DNFed Late in the Day and didn’t even attempt Talent based on your reaction and Sarah’s! I am intrigued by Her One Mistake, but I have got to stop dropping my planned reading for your recommendations. I’m already having to bail on Feb because The Deeper the Water came in at the library! I’m happy I can vet a few books for you. You do the same for me often enough. If you’re looking for a thriller, I actually just finished The Winter Sister and liked it more than Her One Mistake. I had never heard of any of these books :O Where do you get them from? It’s hard to say where I get my books, Annie. All over the place, book lists, catalogs, recs from other bloggers. You know! I’m so glad I was denied for Joy Enough, based on the premise I thought it sounded good but after reading your review, not so much. I’m still thinking I’ll get to Her One Mistake sometime. I like this mini review format! Thanks, Renee. Yes, you were lucky to be denied Joy Enough! I like your Clearing the Shelves feature, snappy reviews! The Tessa Hadley book interests me a bit. Thanks, Susan. I’d love it if someone else I know read Late in the Day. I’d love to compare notes.